I used to do oils before I got so caught up in the crazy business of TV commercials, motion graphics and animation. 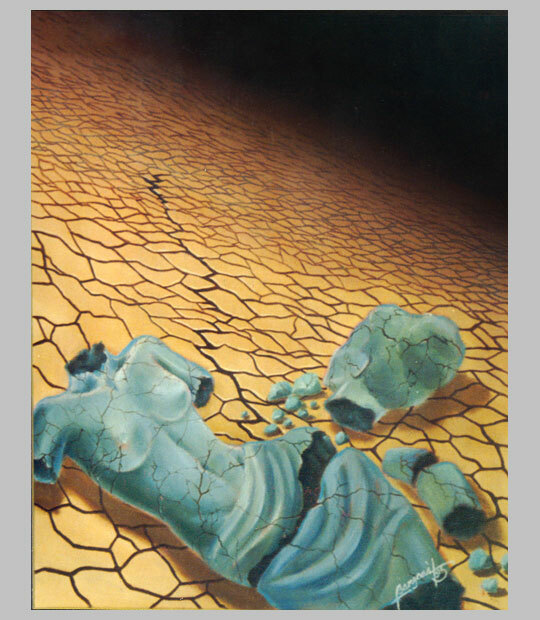 To view my work with airbrushes and hand painted water-based media, go to My Illustrations. My Family. 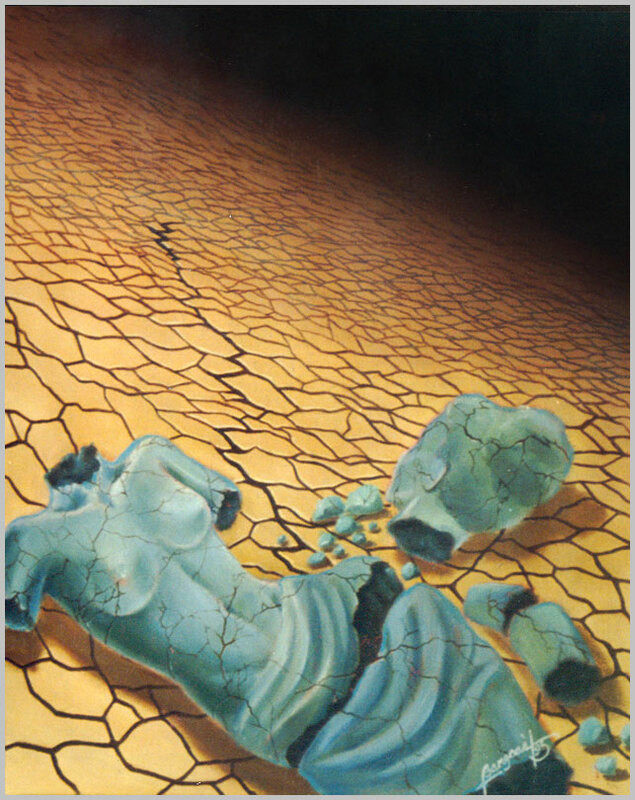 25" x 30", Oil on Canvas, October 1999. 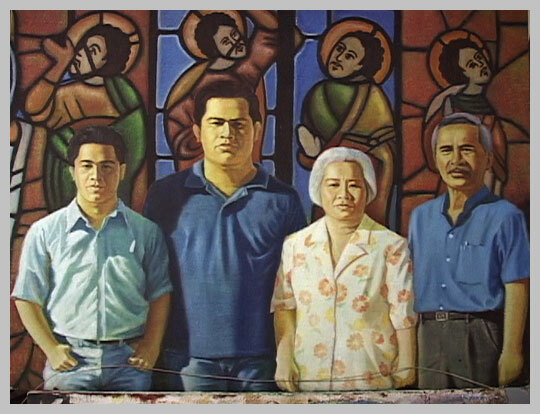 I painted my own family, including my cousin, in oils. This was based on a photo I myself took one morning in September 1998 (my Nikon on a tripod) before heading out to the wharf to get on the 9 a.m. SuperCat for Cebu (Philippines). I added an ornate stained glass window behind us for effect. My Family (above) won 1st Place at Beautiful Art's November (2007) Art Competition, with the subject: A Human Face or Portrait or Family. Many thanks to the artist community at Wicklow, Ireland, especially to Angie Stehle of Beautiful Art for kindly inviting me to join the contest. More power to you all! La Independencia. 25" x 30" Oil on Canvas, July 1993. Metrobank Painting Competition Finalist. There are some trivial stories that come with this painting. One is of my good friend Beboi, who was still a bright-eyed college freshman at that time (Sorry Beboi, the world has to know this!). He came to my study area where my easel was in our boarding house where two of our housemates watched me as I proceeded to outline the steaming cup of coffee in the painting. One of them, Jaymone, an upperclassman, kidded Beboi into drinking the cup of what looked like coffee on my table. The laughingly careless youngster that he was, never noticed that it was being used as the model for my painting. He gulped the contents of the cup without a moment's hesitation, making him spew out a large amount of liquid on my desk as he realized it was not coffee or chocolate after all! It was a mixture of Burnt Sienna and Ivory Black Poster Color that I dissolved in water to mimic the look of coffee. 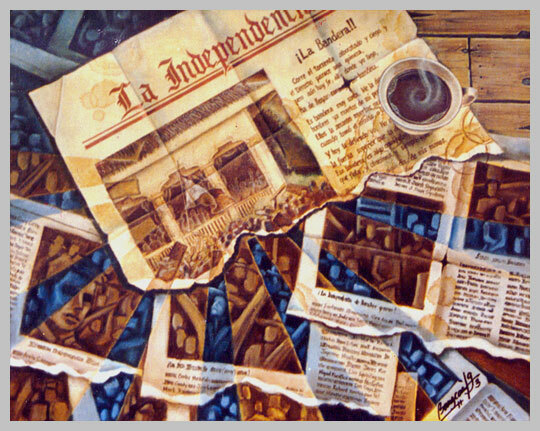 The other thing about this painting is, all the tiny text on the newspaper La Independencia are composed of all the names of the friends I've made so far in Cebu at that point in 1993. So everyone of my friends were proud of this artwork--their names are in it after all! Venus' Bane. 26" x 32" Oil on Canvas, July 1995. It's about a friend I got frustrated with back then. 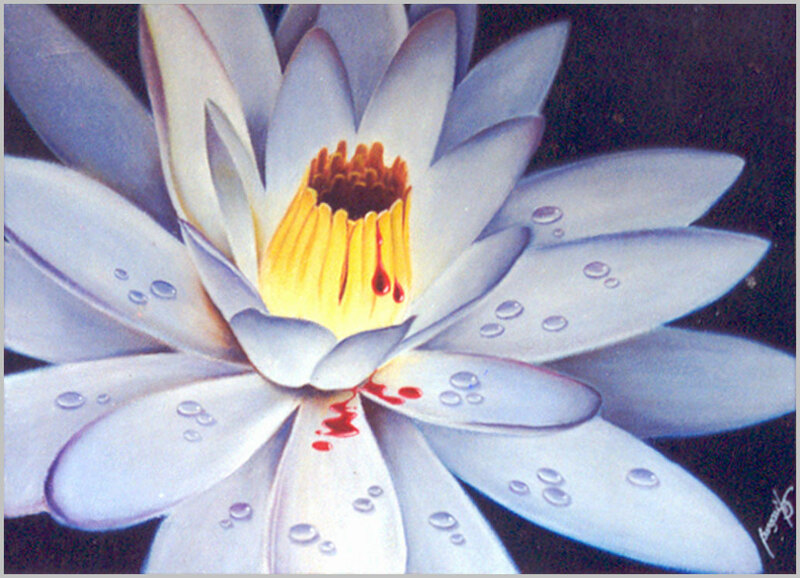 Bleeding Lotus. 24" x 36" Oil on Canvas, August 1995. Based on a series of photos I took of a blossoming lotus at a nearby pond at dawn on the morning of Flor Contemplacion's hanging in Singapore sometime in March of that year. I tried waking up at 5 a.m. for three consecutive mornings just to be in time to capture this flower's elusive early morning ritual of opening its petals. The first morning I was too late. All the lotuses in the pond were already in bloom. The second morning I was too early and by the time they opened up, I got a nasty overcast sky giving me so little light to work with. On that third March morning, I was lucky to capture a time-lapse photo sequence of the much sought after blossoming of the flower. It was also the same morning that the whole Philippines held its breath as Flor Contemplacion waited for a last-minute commutation of her death sentence in Singapore. Denuded Justice. 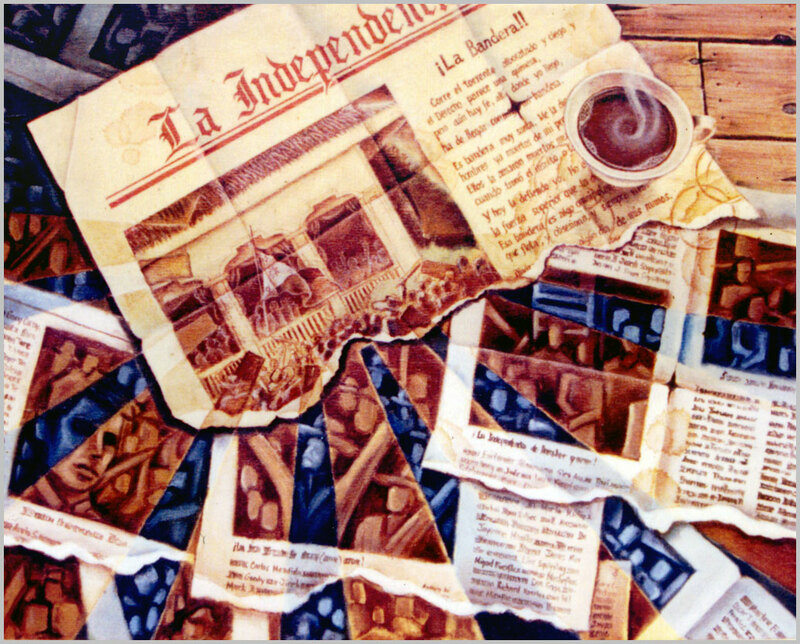 29" x 29" Oil on Canvas, February 1995. A social commentary on the Philippine Judiciary. Malakas at Maganda. 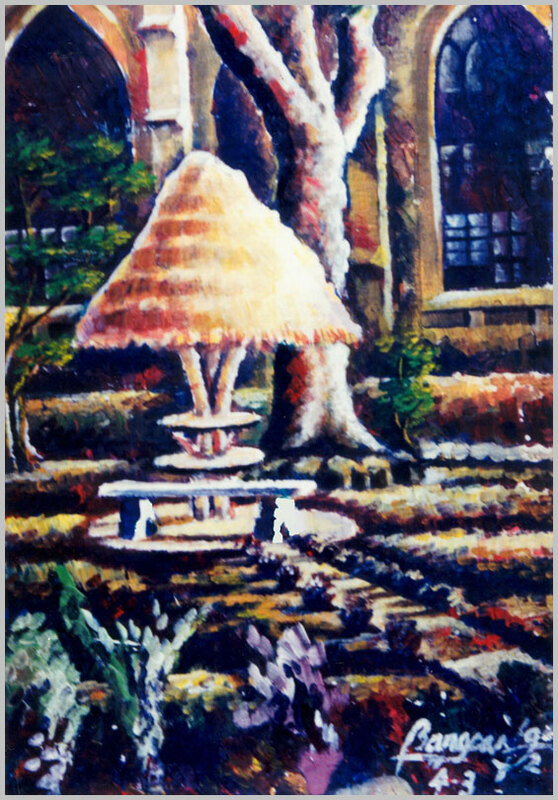 18" x 24" Oil on Canvas, July 1993. Tied with La Independencia for the Finalist slot of the Metrobank Painting Competition. 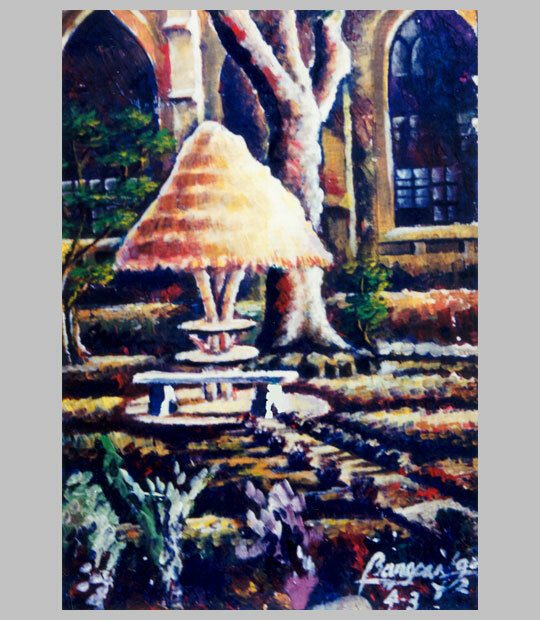 The latter eventually was chosen to be exhibited at Ayala Gallery III in Makati. 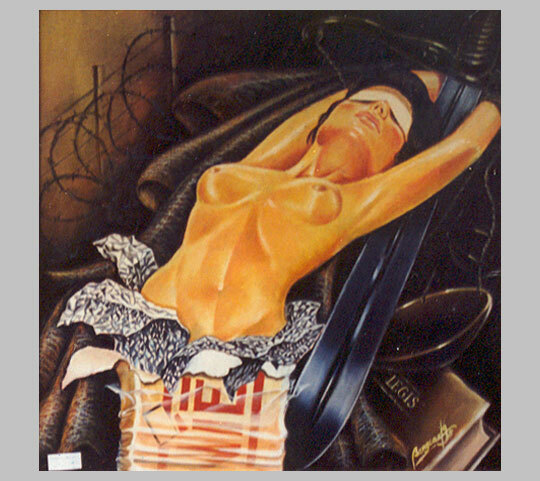 My friend Lino Equipilag loved this painting so much that he came back a few months after his graduation in 1994 and begged me to sell him this. I wouldn't part with it because I also loved it as much. He then cajoled me into making him a copy. So somewhere there's a 16" x 20" copy of this artwork. Click here for larger image. Reflection of Faith. 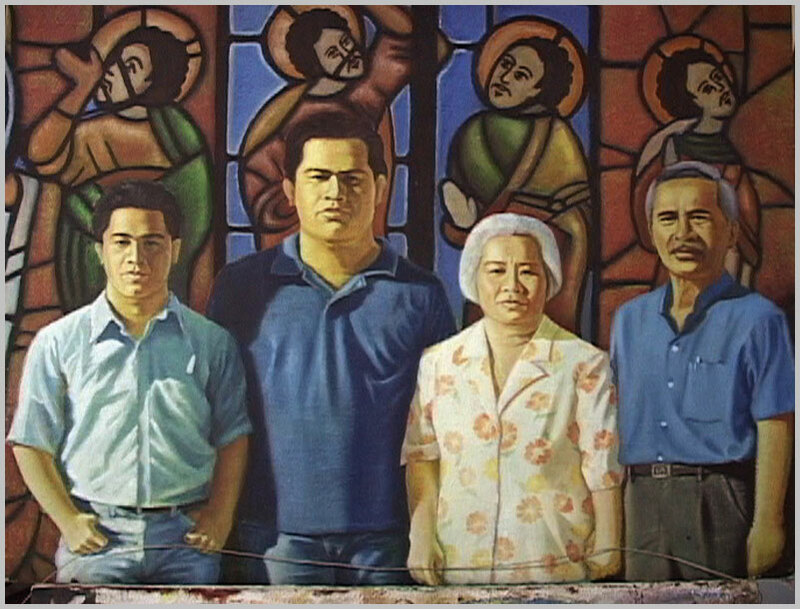 26" x 32" Oil on Canvas, August 7, 1995. A subtly veiled barb at the religious community of Silliman University. 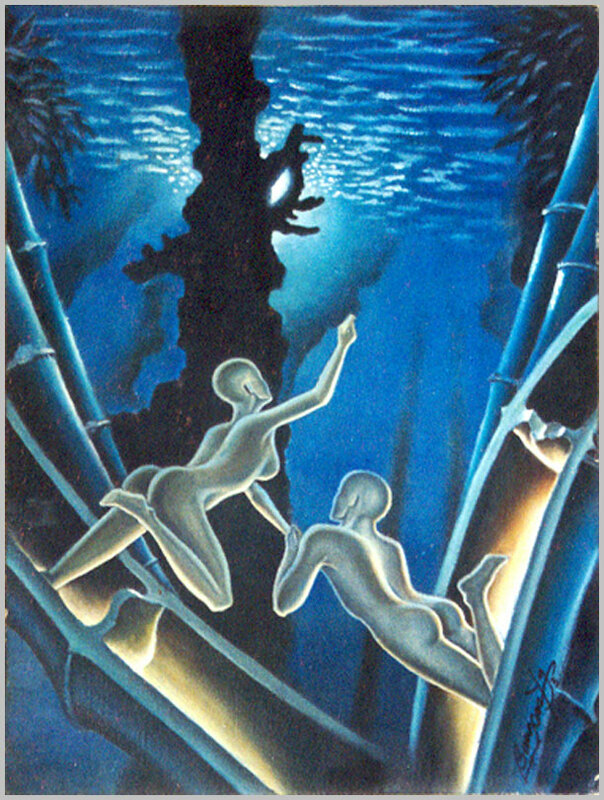 There is a definite date that I remember for this painting. On August 5 my band VINEGAR FLY won the semi-finals for the RJ Junior Jam Battle of the Bands Competition. The gig was at Balls Disco, one of the best-sounding band venues in Cebu at that time. We also played that Sunday at Harrison Park for the winner's night concert along with Invictus, D' Rockers, and 17 Crash. We came home late that night and right then and there, I started this painting. Tracy Teves, our guitar player at that time and Ivan Zerna the bass player, crashed at my place that night (the gig was in Cebu and these guys were from Silliman U., Dumaguete City). 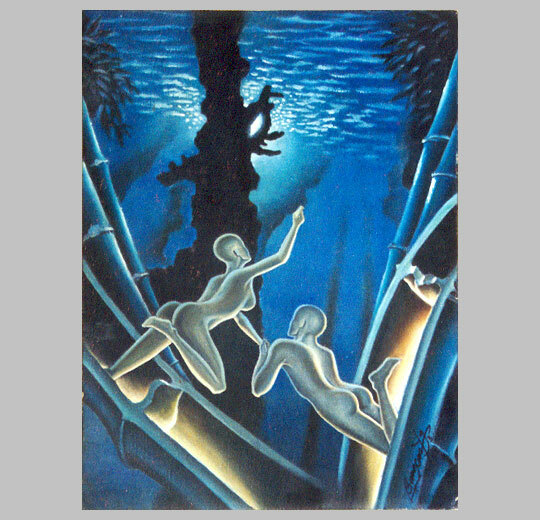 When both guys woke up at 5 a.m. to catch the early bus home to Dumaguete, they were amazed that the painting was done! I started at 12 a.m. and finished it around past 4. I sent them off and went back to touch up the painting and by 8 in the morning I was fast asleep. The reflecting pool in front of the church is non-existent in the real Silliman University Church. I just added it to stress my point: that despite the glowing image of the building, it doesn't have a soul, as the dark reflection reveals. Somebody from that school was admiring it back in 1995 and I just smiled to myself and wondered, "They don't really get it, do they?" Aphrodite's Brew. 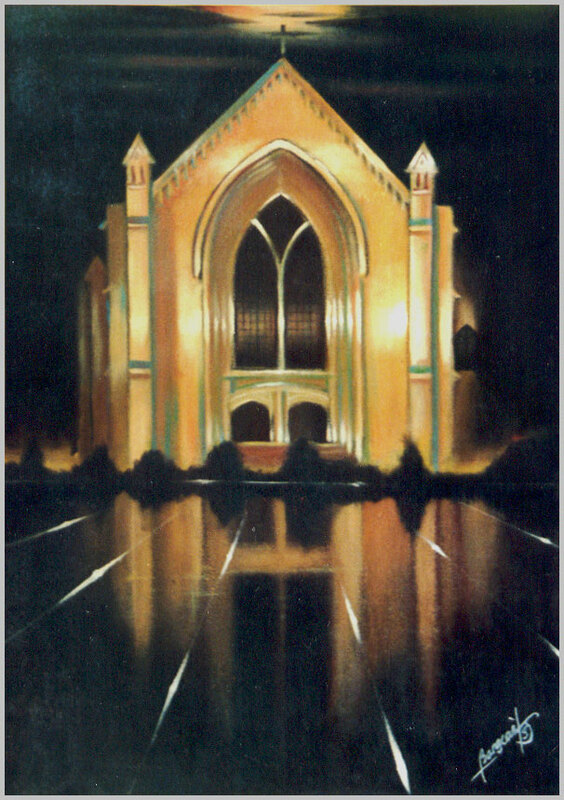 28" x 34" Oil on Canvas, September 1999. My salute to women power. Their beauty is a blessing and can be very powerful as a drug! One of those few artworks where I'm not at all trying to communicate an emotion or address an issue that I feel strongly about. I just painted this for the pure visual pleasure in the beauty of the female. Click here for larger image. 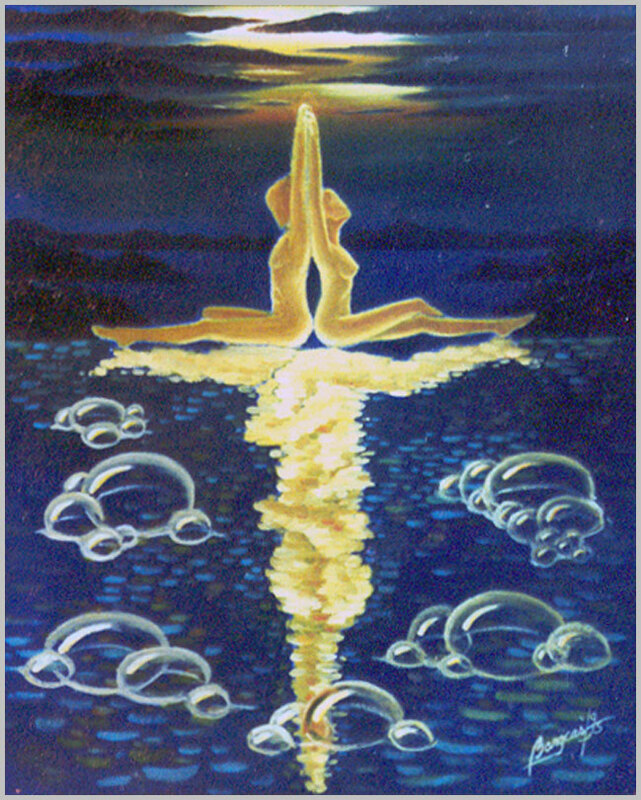 Divine Union. 26" x 32" Oil on Canvas, May 1995. My take on marriage. 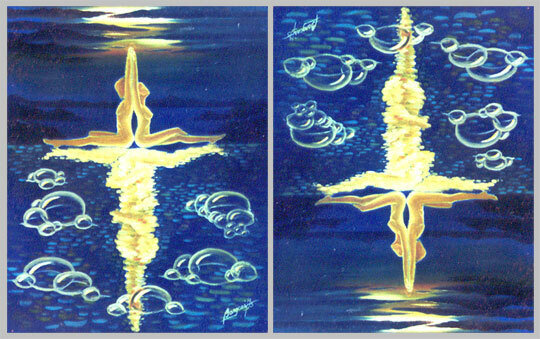 In the painting, you won't know how deep the union is until you flip the image over as seen on the right. Fragility and transience of most partnerships of today are seen as bubbles and moving blotches of color. If you still don't get it, the figures are making love on the flip side. Garden Beside the Church at 3 o'clock. 12" x 16" Acrylic on Canvas, April 1992. One of those on-the-spot paintings that I rarely do. 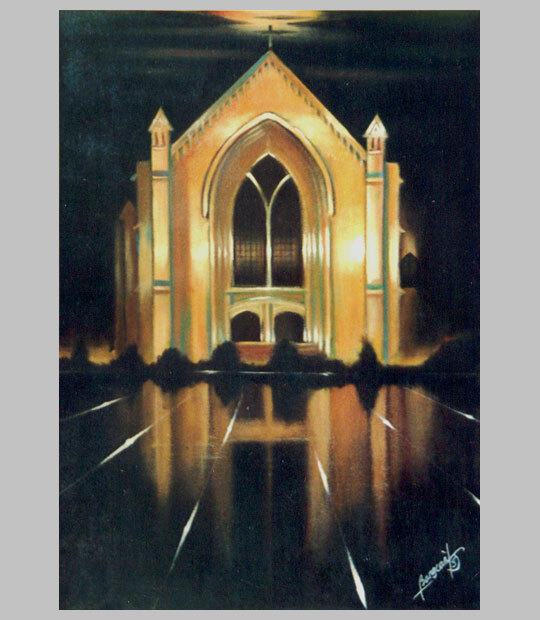 I sat on the porch of the dorm beside the church at Silliman and proceeded to prepare the canvas. Around half past two in the afternoon I began sketching the details of the garden. At 3 p.m., while I was applying the acrylic to the canvas, the sun just hit the hut and the rest of the garden at a gorgeous angle! I hurriedly painted the details to capture that exact moment. By four, while chatting with a friend who had stopped by to keep me company, I was filling in the patches of color that defined the church in shadow in the background. I was happy with the result and I still am happy with this little painting even after 15 years.